The box that the cards come in is a style that I have not seen before – envelope style, made of sturdy cardboard, folding around to the back and tucking in to the back side. The box is black, with a card from the deck attached to the front. With a little common sense and care, this box will hold up to usage. The cards themselves are larger than normal – approximately 3 Ľ” by 5 7/8”. The card stock is good quality, semi-gloss. The backs of the card carry a Ľ ” white border, followed by a 1/8” gold braided border. In the middle of the card the normal card background for the Museo Dei Tarocchi is repeated in each of the four corners, with a cream colored spacing in between. The card titles are at the bottom of the card, gold lettering in Italian. There is no suit or number title on the Pips. The Court Cards show suit and court title. One of the most interesting cards in the deck is the Fool – appearing like a country bumpkin in his jeans, with his bundle over his shoulder and his dog at his feet. The Magician gives me mixed feelings – I loved the use of color (blue tunic with yellow sleeves and a red overcoat, and green and yellow hat that mimics the lemnescate, but his left arm curves over his head, taking away from the “As Above, So Below” imagery. It is good in each of these cards to allow yourself to simply “take in” the imagery, as opposed to looking for the esoteric symbolism. One thing that impressed me was the colored tiles on the floor underneath the Papessa/High Priestess (as well as that under the Imperatrice/Empress, the Imperatore/Emperor, and Temperanza/Temperance). The wings on the Imperatrice/Empress and Temperanza/Temperance are intriguing, and the Eremita/Hermit, in his red robe and blue cloak is certainly someone that we want to know. Forza/Strength is wearing the same “lemnescate” hat that the Magician wears, only hers is blue and pink. The Appeso/Hanged Man shows the traditional triangle formed by the bent knee, but there is no halo around his head. I love the way these cards present themselves – lovely bright colors against a black background, Nice use of green vines and other foliage, and a general impression of quality and heart. More information on this deck, as well as scans, can be seen on Arnell Ando’s ite. 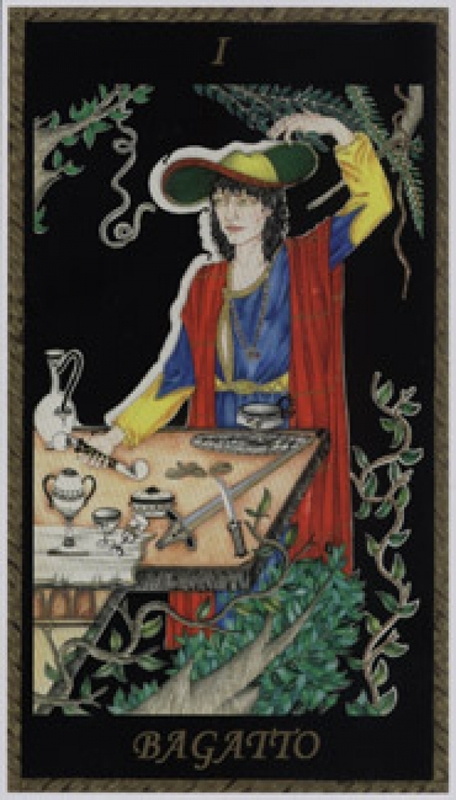 The deck can be ordered from Arnell at a reduced price (for Canada and the United States), or it can be ordered from the useo Dei Tarocchi Bookshop. This is a beautiful deck, very easy to read with, even without the English titles. This is not just a collector’s deck, but a deck that can be used for personal journey work, readings, journaling, as writing prompts – anything that one would expect from a traditional Tarot deck. This is a very gracious honor gifted to an enormously talented artist who left this plane at a very young age. Her work shows heart and soul, and deserves a place in the Tarot world.